“Wah lau eh, everything also Pay and Pay! Where got money to pay for plastic bags, we very poor thing one… Free bags always free what so should be free forever, why must we pay? Actually come on lah, we Singaporeans should know that there is nothing free in life… there are environmental and health costs to “free” bags. 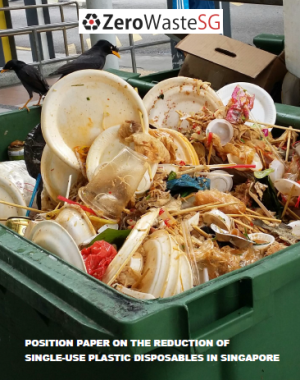 The problem of excessive usage and wastage of plastic bags in Singapore contributes to the wasting of non-renewable oil resources, generation of carbon dioxide emissions from incineration, littering of bags which could become breeding grounds for mosquitoes, posing harm to the marine lives when the bags ends up in the waterways and sea, and affecting our own health when plastics break down into microplastics and enter our food chain. We should not let our children, grandchildren and great great great grandchildren pay for these environmental and health costs in the future so that we can enjoy our “free” plastic bags now. Sekali your children next time ask why you pollute our environment by die die wanting free plastic bags, how you explain? How, huh how? Assuming residents bag their waste and throw it into the rubbish chute once every day and with the occasional disposal, each household would need about 10 bags a week or 520 bags a year. If a typical household takes 520 bags a year from the supermarkets and reuse them for bagging waste, and if there is a 10 cents charge on each plastic bag, it would cost a household $52 a year. 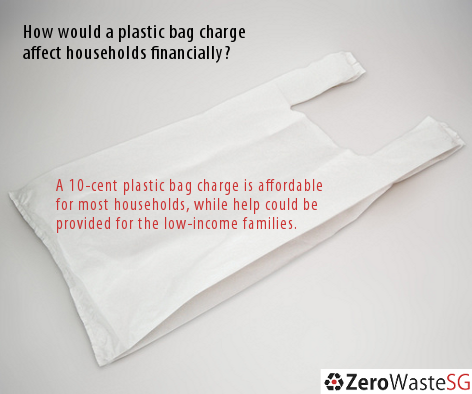 The annual cost of the plastic bags ($52) as a percentage of annual household income in 2015 for different types of housing ranges from 0.06-0.35%, which means that paying for the plastic bags would incur a cost which is still affordable to most households. 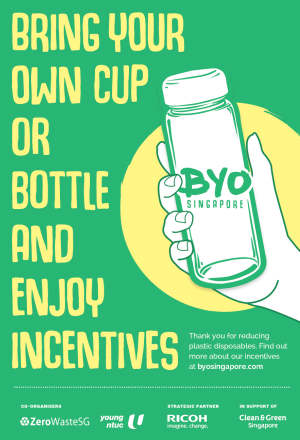 Also, you could take and pay for less plastic bags if you use the plastic bags that are exempted from the charge or other plastic packaging to bag your waste at home (see previous response at http://www.zerowastesg.com/2017/09/28/1-singaporean-response-to-a-plastic-bag-charge/). 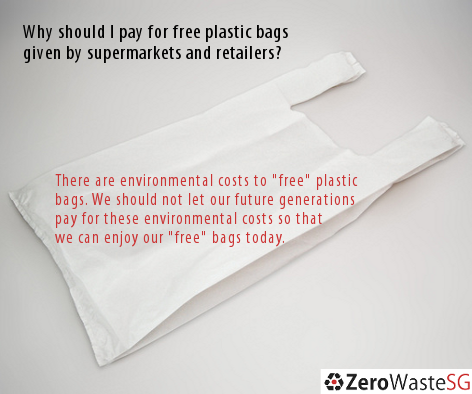 So the actual number of plastic bags that you pay for would be much less! For lower income households, to further minimise the costs of plastic bags, the private sector could help to subsidise the costs of the plastic bags for households in HDB 1- and 2-room flats, or free reusable bags could be given to these households so that they can use them for shopping. The reusable bags could be donated from the public or from the private sector. So, we should support the plastic bag charge as it would be affordable to most households and is the right thing to do to protect our environment, our health and the future of our children, grandchildren and great great great grandchildren. Steady lah! 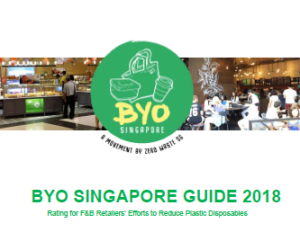 Relac lah, bro and sis… the plastic bag charge policy can be designed such that certain bags are exempted from the charge for hygiene and safety reasons… which means you still have some FREE bags although not as many compared to the past. 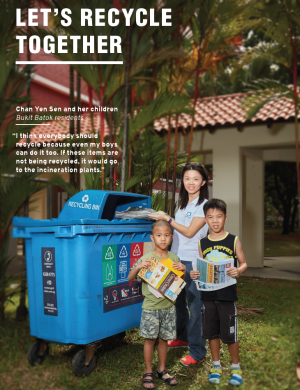 Heng ah, you can still use these free bags to bag your waste! 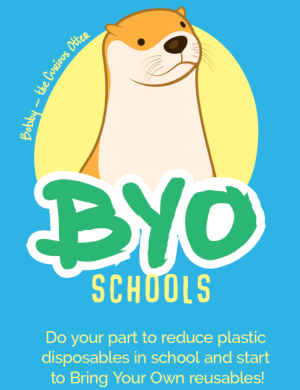 You can also use the plastic packaging that comes with other food or products for bagging your waste, such as the outer bulk packaging for coffee sachets, bread bag packaging, etc. As a famous contractor used to say, “Use your brain” and be creative. Also remember that the smell and pest problems are caused by food waste, so we should bag food waste using the limited plastic bags (that we still get for free) or other plastic packaging. All other items that are recyclable such as clean and dry paper, plastic bottles, metal cans and glass bottles should be recycled via the recycling bins in your estate and not disposed in the chute. Other non-food and non-hazardous items that are not recyclable can be thrown into the chute without bagging. If you have too much waste in your house that you don’t have enough bags to bag your waste, your first concern should not be whether you have enough bags, but why you generate so much waste and if you could reduce the waste generated. Bring your own reusable bags when shopping. Use the plastic bags that are exempted from the charge or other plastic packaging to bag your waste at home. 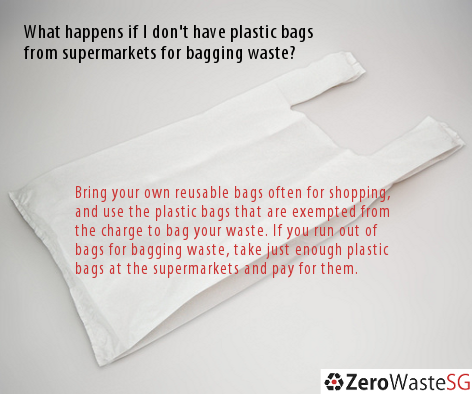 If you really run out of plastic bags for bagging waste, take just enough plastic bags when shopping and pay for them. Question: To ask the Minister for the Environment and Water Resources whether the Ministry will consider imposing a charge on plastic bags at supermarkets. 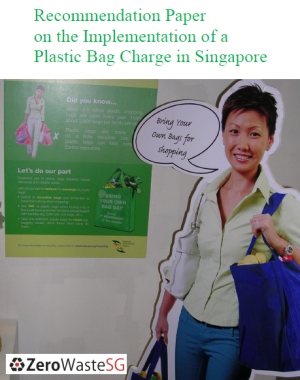 In Singapore, households generally re-use plastic bags to dispose of their waste in a hygienic manner. In addition, plastic bags which are thrown away are incinerated safely at our waste-to-energy plants before they are landfilled as ash. This is in contrast to other countries where waste is directly landfilled. In these countries, plastic bags, which are not biodegradable, may remain in landfills for a long time or find their way into the sea. A plastic bag charge could have “unintended consequences”, such as the substitution of these bags with paper bags or even wastage of reusable bags, Senior Minister of State for Environment and Water Resources Amy Khor told Parliament on Wednesday (Nov 9). Sufficient educational and enforcement measures also need to be in place to complement a charge and reduce shoppers’ demand for plastic bags, she said. Ms Khor was responding to MP for Nee Soon GRC Louis Ng’s question on whether the Government would consider imposing a charge on plastic bags at supermarkets. Eugene Tay has divided opinion, and in recent weeks, the issue has been plastic bags, and the possibility of a plastic bag charge. A trained environmental engineer, the Executive Director of Zero Waste SG is also Founder and Director of Green Futures Solutions, a sustainability consultancy that helps companies and organisations address environmental challenges and identify green opportunities. Tay started Zero Waste SG eight years ago and has since then been campaigning against the use of plastics in general, food waste and promoting recycling. In a recent position paper, it recommended that the government make it mandatory for retailers to charge for plastic bags. Tay says he’s not advocating a ban, but a reduction in usage.